The most unexpected and slightly annoying thing about the property is that you can hear planes loudly all hours of the day and night. Don’t remember it being so bad at other Vegas hotels. Liked the memorabilia. Music was good. Liked it was close to airport. Great property. Nice spacious rooms. And multiple good restaurants to choose from. Big and nice rooms. The Center Bar was cool. And the pool was awesome. Enjoyed our time at the hotel and casino , did feel like it has become a little outdated and needs to be a little updated, the staff was very nice, can’t say enough about Stan , works the front entry , he was great! Fast check-in. Friendly reception. Rooms are clean. We didnt get the type of room we booked. We were charged resort fees but the pool wasnt open while we were there. It was ok but nothing spectacular. Everything was great with the stay, but no in room coffee? Thomas and Mack Center is within a mile (2 km) of Hard Rock Hotel & Casino, and other popular attractions like T-Mobile Arena are within a few miles (5 km). This 1504-room, 4-star resort welcomes guests with 9 restaurants, an outdoor pool, and free in-room WiFi. There are ample dining options with 9 onsite restaurants, including MB Steak, which specializes in American cuisine. Savor a meal from the privacy of your room with 24-hour room service, or get a pick-me-up at the 2 coffee shops/cafés. For your convenience, a full breakfast is served for a fee each morning from 5:00 AM to 4:30 AM. Guests can expect to find free WiFi. Beds sport premium bedding. Other standard amenities include a minibar, free local calls, and a laptop-compatible safe. At Hard Rock Hotel & Casino, guests enjoy features like an outdoor pool, a fitness center, and free WiFi in public areas. You can take advantage of free valet parking if you drive. The front desk is staffed 24/7 to help with luggage storage, tours or tickets, and dry cleaning/laundry. Additional amenities include a meeting room, a business center, and a seasonal outdoor pool. Full breakfast is served daily from 5:00 AM to 4:30 AM for a fee. MB Steak - Restaurant and bar specializing in American cuisine. Open daily for dinner. Nobu - Fine-dining restaurant and bar specializing in Japanese cuisine. Open daily for dinner. Pink Taco - Pool-view restaurant and bar specializing in Mexican cuisine. Open daily for lunch and dinner. Culinary Dropout - Pool-view restaurant and bar specializing in American cuisine. Open daily for brunch, lunch, and dinner. Mr. Lucky's - Restaurant specializing in American cuisine. Open daily for breakfast, lunch, and dinner. Open 24 hours. 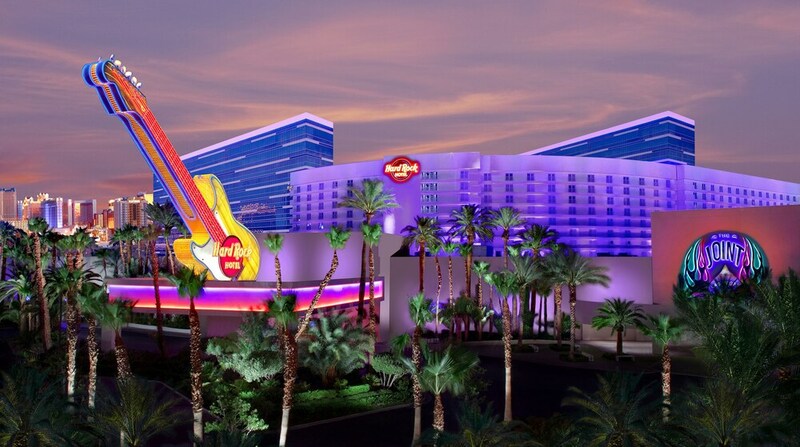 Recreation features at Hard Rock Hotel & Casino include an outdoor pool and a fitness center. The front desk is open 24 hours a day, and checking out is easy with express services. Driving? This property offers free valet parking.